The following quote comes from a customer of ours who uses this as their slogan “Quality isn’t expensive… It’s priceless” and it rings true in many ways, especially when it comes to web design. Contractors spend thousands of dollars on their tools, trucks, and equipment, but many won’t invest the money into a good web presence to keep their tools, trucks, and equipment working! I’m going to explain how this applies to your website and where so many contractors get this backwards. Here are a few quick points, and we go into much more detail below. They assume because a website looks nice that it must work well. Low cost websites have very thin, weak, duplicate content, with no substance. Low cost websites often lack the fundamentals of good usability. Low cost websites often lack the fundamentals of good SEO. The quality of your contracting company website should not be measured by how “good it looks” or how “cheap it was” or “how fast” the designer was able to build it. Without results, these are totally meaningless metrics and aren’t how a successful web presence is measured. A quality website should be measured by the amount of new prospects and opportunities it brings to your business, nothing else. Your website should be measured by it’s ROI (return on investment). Many construction and trades contractors assume that a website is a website is a website, as long as it looks nice they are really all the same. Therefore, when construction contractors begin their search for a web developer to build a website for their company, they often shop solely on price and will jump at the first website offering that they can afford. They often assume that because a website “looks nice” that is must also work well at generating clients. Unfortunately, that’s just not the case and is a surefire way to part with your money. All websites are not created equal, no matter how nice they look. There are dozens of moving parts that make a great web presence, especially for a construction or trades contractor. Some of these moving parts are on the surface (frontend) and you and your visitors can see them. Many are on the backend, which you can’t see so most contractors don’t even know if they’re missing. Nowadays there are so many pre-built themes out there for sale that it’s become incredibly easy for anyone with a computer and Internet access to hang up a web designer shingle in their office and fancy themselves a digital marketer. This doesn’t make them “good” at what they do, but still, many contractors fall for their well laid trap of an “affordable” web design. Places like ThemeForest have thousands of overseas developers that churn out cheap website themes for all kinds of industries. The introduction of these cheap “ready-built” websites has attracted many inexperienced web designers and wannabe Internet Marketers who buy these cheap pre-built themes for $30-$60 and they then resell them to an unsuspecting contractor for quite a bit more money either as a one-off payment or on a monthly plan. What the contractor often doesn’t know is that their website was developed with an off-the-shelf theme in just a couple of hours. This doesn’t really equate to a quality web presence, while it might look nice, it’s often lacking all of the underlying work “behind the scenes” to actually deliver any type of results for the business owner. The business owner often figures this out after several months of paying their web developer for their services and not getting any results. It’s kind of like throwing a bunch of 2 x 4’s on the ground and calling it a deck. The inexperienced web designer often strings their client along for as many months as possible, promising that “results take time” until the contractor gets fed up and begins looking for a more effective solution. By this time they may have already spent several thousand dollars on an ineffective solution. Sadly some contractors will do this more than once until they finally understand that a good website is worth it’s weight in gold. Others will be turned off the process for good, swearing that all web designers are crooks and Internet marketing didn’t work for their business. In most cases when a web developer is selling a cheap or affordable website it’s because they are cutting corners with your web presence. They are not really concerned with your results, they are more concerned with delivering something that looks “nice” so you, the client doesn’t feel like you’ve totally wasted your money. The amount of work required to build an effective web presence for a contracting or construction company unfortunately far exceeds the price range they are usually offering their sites for so in order to meet that price point your web developer must cut corners somewhere, it’s inevitable. They either cut these corners with the full knowledge they are under delivering or even worse they are just inexperienced and are cutting corners because they don’t really know what to do. Inexperienced web developers offer their websites at a lower cost because they feel this will give them the edge over higher priced competition and make their offering more attractive. However, the competition is often higher priced because of their experience and their ability to get results. They are putting in a lot more effort for the client. Beware of the generalist web developer who will build websites for the local hair salon, restaurants, lawyers, or any type of business that approaches them. Most industries require such different approaches to online marketing that a web developer who is building websites for everyone doesn’t focus on one area long enough to really get to the point where they have an excellent proof of concept that can reliably deliver leads. If you’re a construction or trades contractor it’s important you choose a web developer who specializes in building websites for construction and trades contractors. They will know and understand your business better. #3. Your site looks nice but isn’t found anywhere in search engines. If your website doesn’t start showing up in search engines for some of your keywords or phrases within about 30-60 days of it’s launch it’s because something isn’t right. Ranking for competitive keywords can certainly take more time than this (and a lot more effort) but an experienced web developer will be able to tackle some of the low hanging fruit keywords in your market in an effort to get results coming in faster. An inexperienced or low-cost web developer often doesn’t put the time or research in to get this done. #4. Your site only has 5-10 pages. A small website footprint or a web developer that wants to charge you “per page” is often doing the bare minimum to get your website up. Many contractors think the less pages the better (cheaper) their website will be and many low-cost designers don’t have the time to much more. The truth is, your website needs to have a solid page “footprint” with enough pages to efficiently cover all of your core (most profitable) services and all of your target service areas. This usually ends up with a website that is 30-50 pages in size for most construction contractors. This large page footprint creates new opportunities for you to be found as each and every one of your pages can be ranked independently in search engines. This is a perfect example of thin, weak content. This developer has used this same text on every single painting website they’ve built. 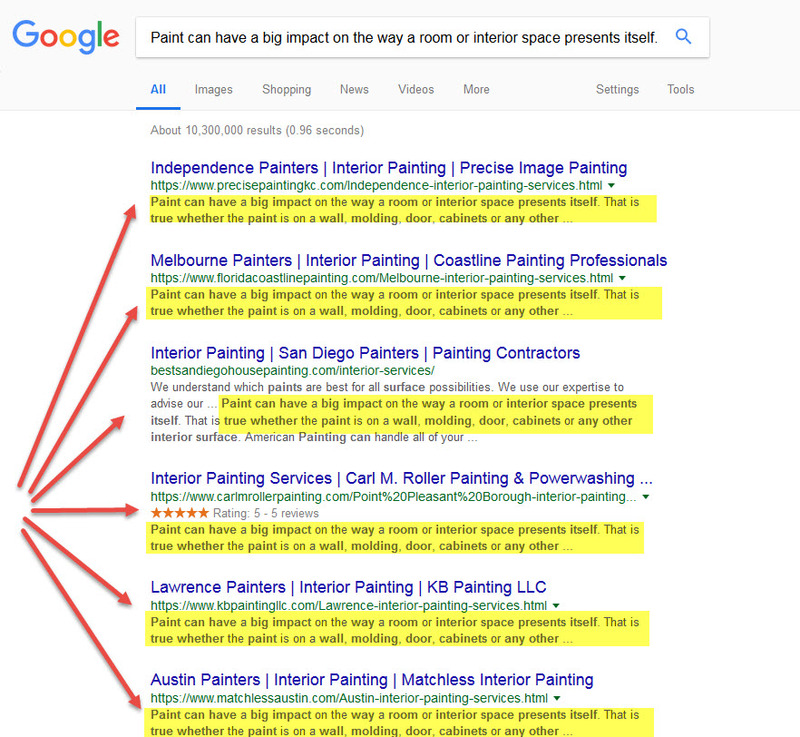 This duplicate content actually hurts these contractors websites. This developer claims to have your website up in two business days! This is WHY they can do it in two days. The content is just copy/pasted from one website to another. This offers ZERO benefit to a contractors web presence. Poorly written content is often poorly written because it’s been farmed out overseas or on a freelancer website to the cheapest bidders. These writers know very little about your local market or the intricacies of the services you provide. They are however good at putting a mashed up word salad on your pages. This becomes obvious when you read the content as it will be full of generalizations, spelling and grammar mistakes, and will be rehashing much of the same promises they see on other websites in your niche. Sometimes the content is just copied from one site to another and this can negatively affect your websites ability to rank well. When you hire a low cost web developer they simply don’t have the time to invest into great content for your website or they’ll expect you to write it all on your own. Good luck with that! Remember, the measure of a website success or it’s effectiveness for a contracting or construction company is the results it delivers for your business. It’s effectiveness is not measured by it’s looks or it’s low price. If the website doesn’t deliver new project leads then it’s a waste of digital space and will sit and collect digital dust until someone comes along and fixes it. Most inexperienced web developers don’t talk about client ROI because their clients don’t have an ROI. What they have is usually a glorified online business card rather than a super-tuned and polished professional salesperson working 24/7/365 (what a good website does). If your website goes weeks or months between project leads that come through then it’s a surefire sign that your web presence is ineffective. Maybe your website has never even generated a single lead! This is not normal for a properly built and well optimized construction or contractor website. If your website is found at the top of Google and other search engines for your services in your local area it WILL generate leads, even if it’s an ugly website. Being found by customers should be one of your websites main objectives. Rolling icons, bouncing icons, large flashy home page sliders, and other digital wastes of space that look “cool” offer ZERO in the way of improved usability for your visitors and actually work to hurt your conversion rates. Inexperienced developers often over-use these elements in an effort to impress their client but the client (and the developer) are the last people your website should impress! You need your website to impress potential customers! Often contractors or their inexperienced web developer don’t know how these elements can actually hurt your web presence (or they just don’t care). These animations often slow your website down, they don’t work well on mobile devices, they distract your visitors, and they waste the most valuable conversion real estate on your website. Use them sparingly. You’ll everything from your website isn’t old enough, you don’t have enough reviews, you don’t have enough photos, or you just have to be more patient. These can all certainly be valid reasons for a website to not work well but they are also excuses for poor performance if a web developer hasn’t done their job. The sole purpose of a website for your contracting company is to make your business look professional and to attract new project leads for your most profitable services. Hiring someone who is inexperienced is sort of like lighting your money on fire. What many contractors fail to think about and consider is all of the lost opportunity that occurred over the many months you’ve engaged their services. While your inexperienced web designer messed around with your web presence and you weren’t being found, you had competitors who were crushing it with their websites and closing jobs that you could have had an opportunity to bid but those clients never knew you existed because they couldn’t find your website. Often this process takes the contractor through one or two or three different web developers until they finally someone who has the experience and the knowledge to get them results and by this time they may have already spent several thousand dollars on ineffective solutions. How many times does a contractor need to buy $500 – $1500 websites until they realize they’re being taken advantage of? You’d be surprised how many go through this again and again! How Can You Prevent Yourself From Falling Into The Low Cost Website Trap? The only way to prevent yourself from falling into the low cost web design trap is to carefully choose your web developer. Any web developer with experience and a track record of results is going to charge more for their services. Be prepared to spend more money than you originally might have thought you’d need. At Sites4Contractors.Com we’ve built websites (and gotten great results) for a few hundred construction and trades contractors including roofers, remodelers, landscapers, concrete contractors, home builders, plumbers, and many more. Starting with a proven theme and website layout. Mapping out an excellent page footprint that covers our clients services and service areas. Writing engaging and persuasive content that positions our client as the expert and provides value to a visitor. Incorporating bold and strategically placed “calls-to-action” throughout the website. Researching our clients local competitors so we can help our client compete. Implementing rock-solid and cutting edge SEO and Internet Marketing so our client gets found. Does your current website deliver the results you were expecting? Are you ready to transform your website into a lead generating asset for your company? If you’d like to see how we’d be able to your contracting company develop a better web presence request one of our FREE website analysis and consultations and we’ll show you there is a better way!